Last night, we celebrated a friend’s birthday and we decided to give the newly opened The Ranch Restaurant & Saloon in Anaheim a try. The restaurant is beautiful, stylish, ranch-style interior with dark woods, and like one of my girlfriends said “very manly”. It was too dark to take photos of the interior, but if you visit their website, there are some lovely photos you can look at. 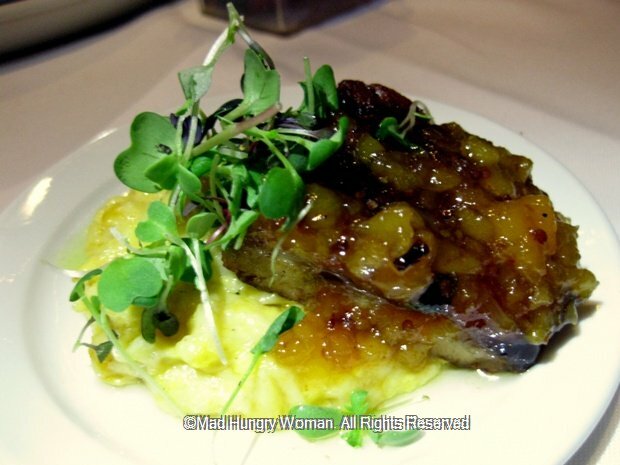 It was also the start of restaurant week and what I really liked about the menu here was that they selected items off their regular menu instead of creating a whole different one for this event. 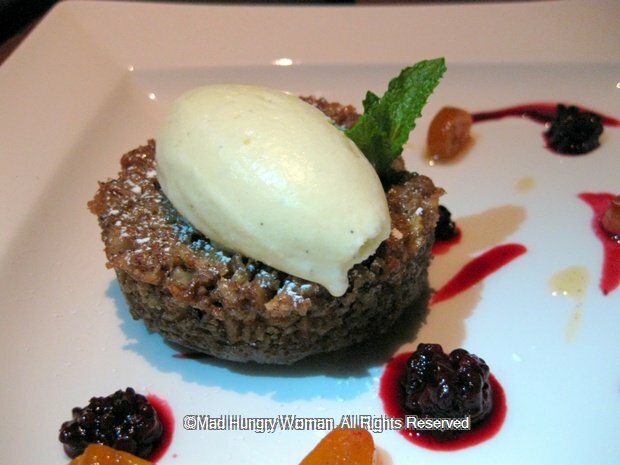 There were three choices for appetizer, entree and dessert and we tried all of them. The 3-course menu is $40 for dinner but I have included the regular a la carte pricing for your reference. 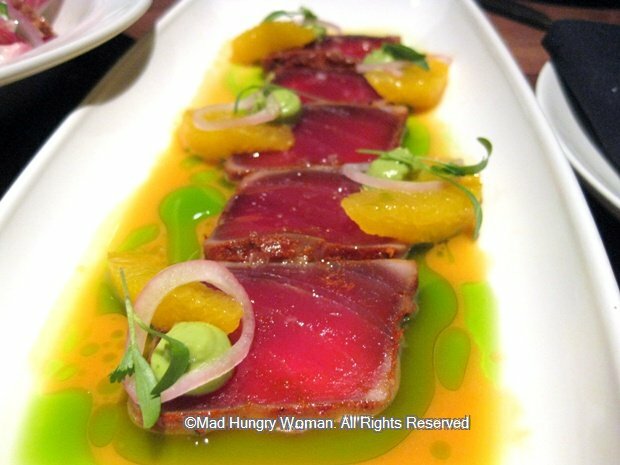 Hawaiian Big Eye Tuna Crudo ($14) were thick slices of sushi-grade tuna dressed with aji amarillo chile, sweet naval orange and avocado cream. The slightly tart sauce with a little kick was a perfect way to start the meal by giving those taste-buds an awakening. 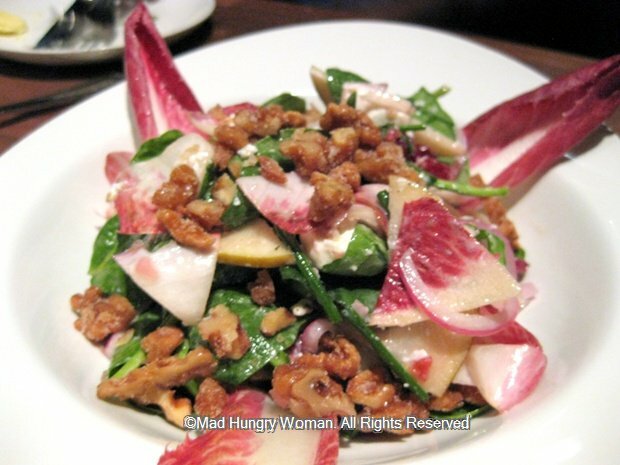 Organic Baby Spinach Salad ($10) with Sierra Nevada goat cheese, Bosc pears, candied walnuts, sun-dried cranberries is great for vegetarians and even those who are not will enjoy it. I especially liked the radicchio which off-set the sweet tart flavors with a touch of spicy bitterness. 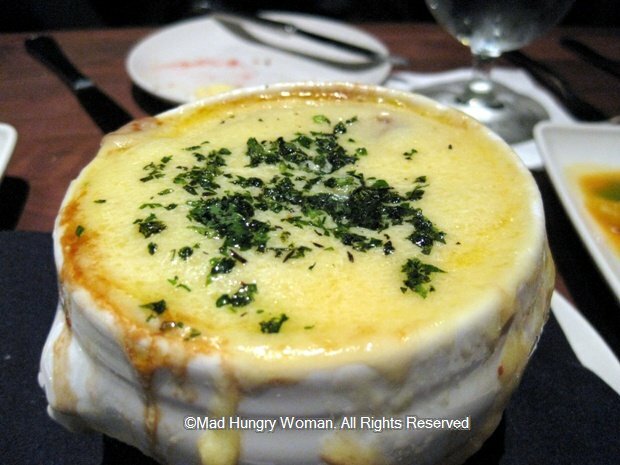 I’m a huge fan of onion soup and whenever I see it on the menu I always order it. Five Onion Soup ($9) with aged Gruyere, yesterday’s bread and Guinness is rich and hearty with soft onions and a strong cheesy topping. I love Guinness and could totally taste it in the broth. Definitely a winner in my book! When the entrees arrived, I was very surprised to see full-sized portions. I asked our server if these were the same size as the a la carte menu and she said yes. This is very rare for restaurant week which impressed me even more. 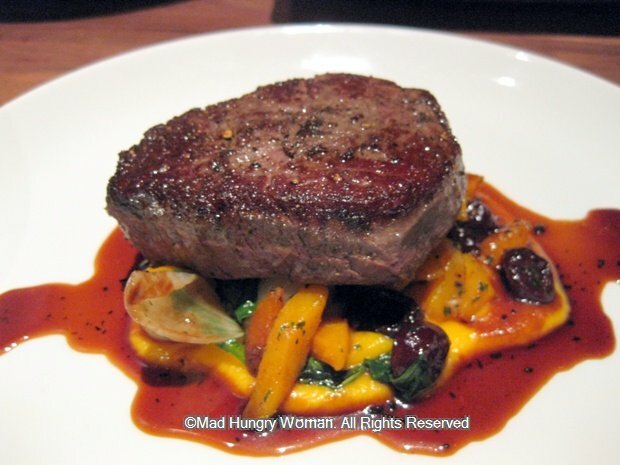 Petite Filet of Beef ($30) is tender with a nice meaty taste. Usually, I’m not a big fan of filet because it tends to have less flavor than other cuts but this was surprisingly robust. Butternut squash, sundried cherries, cipollini onions and Tennessee truffles accompanied. 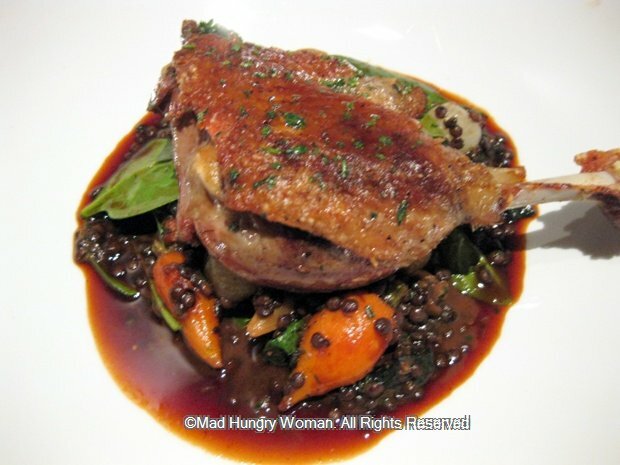 The star of the evening was Confit of Muscovy Duck Leg (which is the only dish not currently on the a la carte menu). I think we were all in agreement that the meat was tender while the skin was crisped to absolute perfection. I could find no fault with this, not with the duck, nor with the accoutrements of beluga lentils, house made guanciale and baby root vegetables. 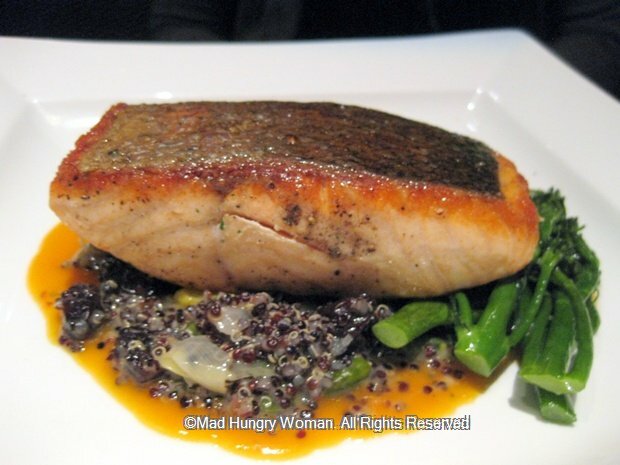 We were also surprised by Skuna Bay Salmon ($25) served with black quinoa, California pistachios, vine-dried grapes and tangerine nage. The fish was moist, tender and melt-in-your-mouth. Everyone loved the quinoa and the citrusy sauce which lined the plate. We were all skeptical about ordering salmon because of past experiences with it being overcooked, but no, it was perfect. By now we were all pretty full and quite blown away by what we’ve eaten. But we still had dessert to come. I was quite happy at this point and couldn’t care less if I got my dessert or not, but I did try all three of them. Old Fashioned Pecan Pie surprised me. I honestly didn’t think I’d like it. There is no crust — a definite plus — and it wasn’t overly sweet — another plus! I think the fact that it was sweetened with honey might have something to do with it. Topped with a delightful Jack Daniels ice cream, candied kumquats and garden blackberries, this was indeed a lovely treat. 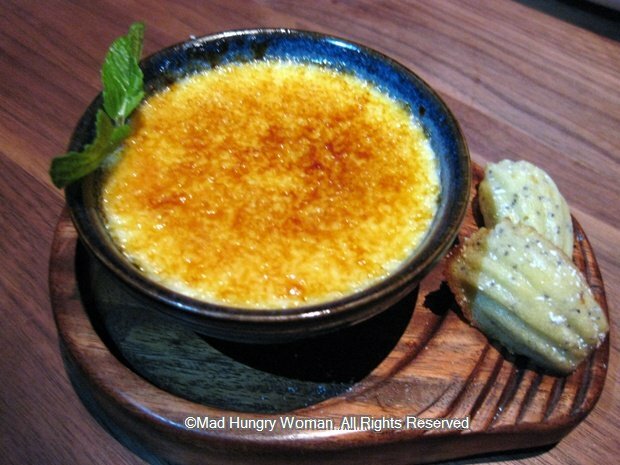 I’ve always liked creme brulee and Tahitian Vanilla Bean Creme Brulee did not disappoint. The texture was creamy and the caramelized top was also done well. It was frankly a very good creme brulee. Lemon poppy seed madeleines accompanied. 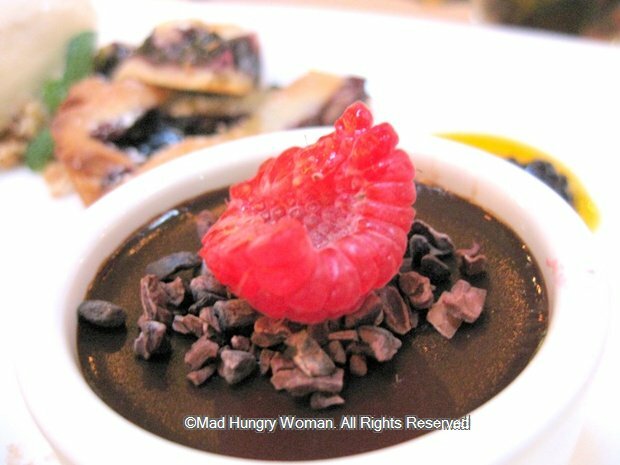 PBJ & Milk Chocolate Bar was too heavy after our big meal, but I absolutely loved the Concord grape fruit ‘gelée‘ the bar was sitting on. I wanted more of the grape and less of the peanut butter bar. 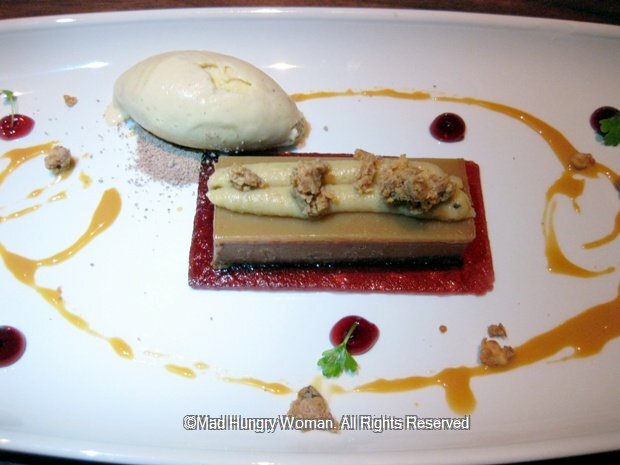 The caramelized banana ice cream was also incredible! I probably would’ve been happy with a big scoop of this for my dessert. I wonder if it can be arranged? 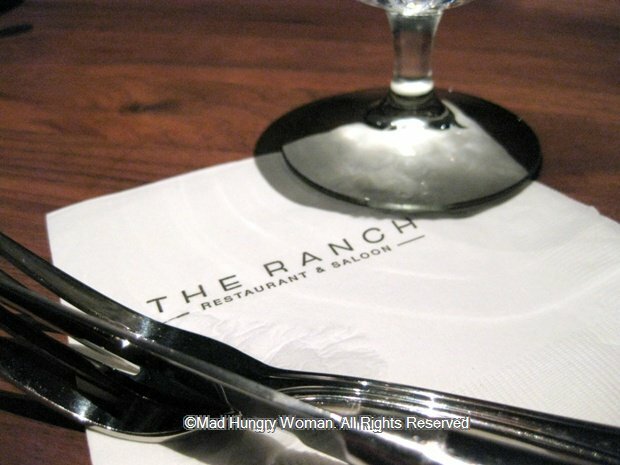 I’ve never been terribly impressed by restaurant week menus, but The Ranch definitely won me over. This is a place I would feel comfortable coming back to and bringing friends along for a celebration or for no reason whatsoever than just to have a great meal! They have set the bar pretty high for OCRW 2012 that’s for sure! If you dine at just ONE restaurant this week — go to The Ranch. It’s worth every penny of the $40! Ever since a friend of mine introduced me to this place, I’ve been coming here whenever I’ve been craving Mexican food. 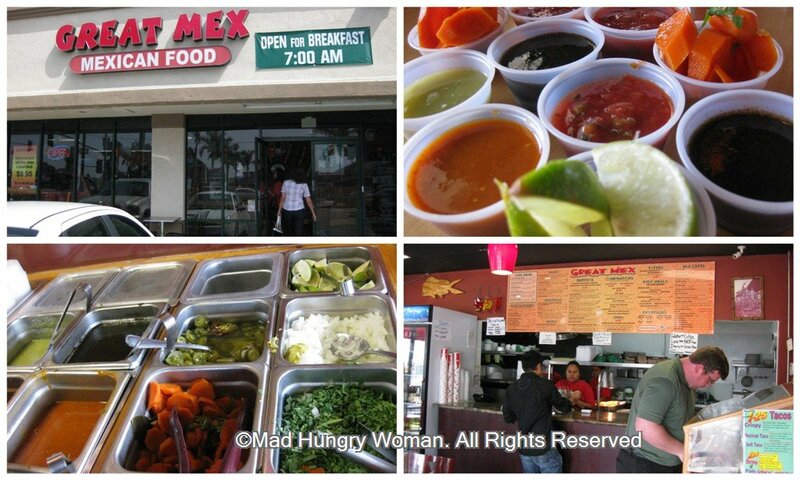 A small hole-in-the-wall, Great Mex is one of those places where food is simple but delicious and absolutely down-to-earth without any pretension. There are three locations in Orange County and I recently visited their newest location in Costa Mesa hidden in a generic looking mall, easily missed if you’re not looking for it. 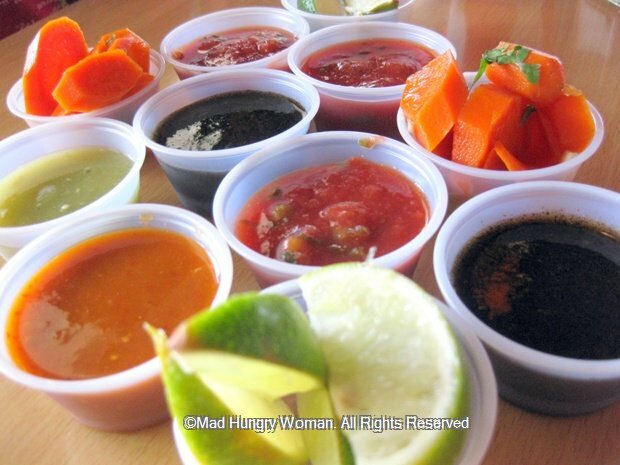 There is a salsa bar with a bunch of really great salsas ranging from mild to those with some kick to it. I love the smoky darker salsa as well as the one with a kick to it. Usually, I mix the two together. The chips flow endlessly if you want them to — just ask! 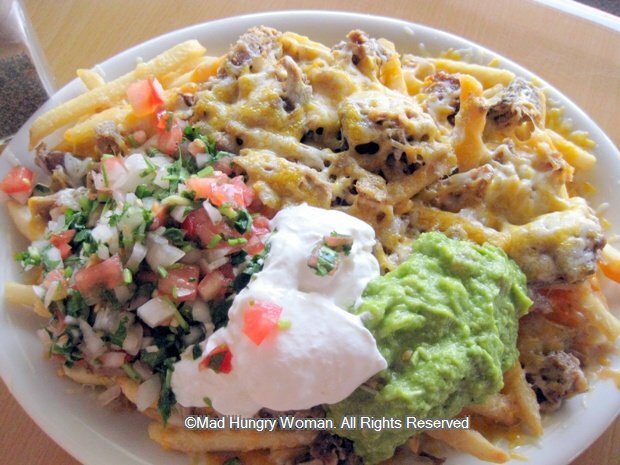 The Carnitas Fries here puts some others (I’m not naming names) to shame, both in flavor and size. For $5.95, the ginormous portion is so huge there is no way one person can eat it all — well I guess if you’re absolutely famished, maybe. There is a lot of meat, guacamole, pico de gallo, sour cream and cheese. 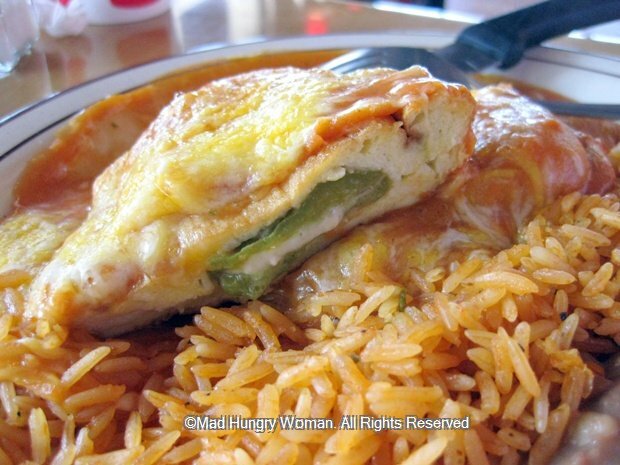 I normally am not a big fan of Chile Relleno ($2.50 a la carte $5.25/combo) because it is so heavily battered. Here, the coating is thin and all you get is a delicious pepper filled with cheese which oozes out when you cut into it. What could be better than that? This is the best chile relleno I’ve had in OC. If you’re a taco fan, try the ones here. They run about $2 each and my favorite is the al pastor. 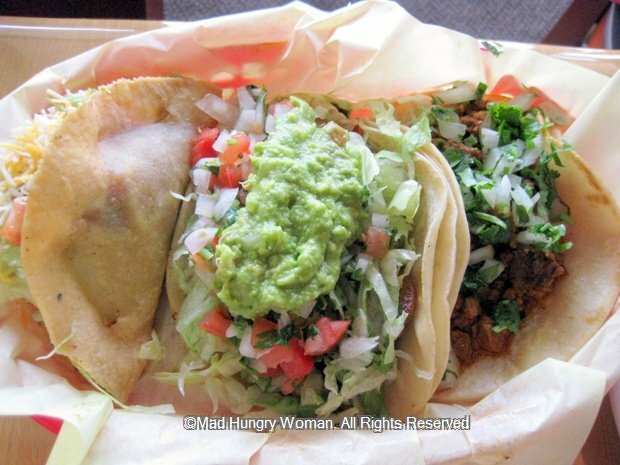 Vegetarians can order the potato or mushroom taco (which they’ve recently added to the menu). However, my all time favorite is the shrimp taco! I get it every single time I come here. I’ve been here once a week ever since my first time here and I’m completely hooked on the enchilada — well the enchilada sauce really. I’ve never liked enchilada before. I think I’ve finally figured it out, it’s the sauce! The roja sauce is simply amazing here. They definitely don’t put enough on the enchilada for me. Breakfast is pretty tasty too. 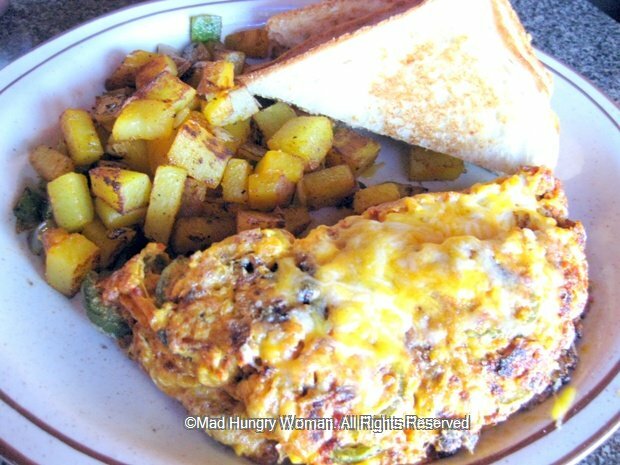 Chorizo omelette is jam packed with chorizo and jalapenos, served with potatoes and toast. The portion is so generous I was able to make two meals out of it. If you’re looking for something light, check out the chicken salad. 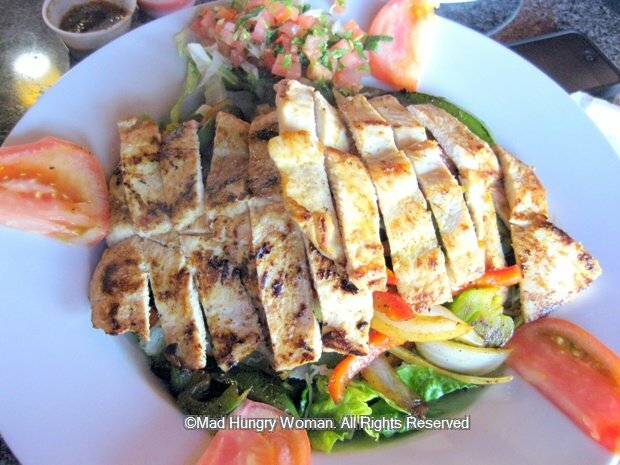 A grilled chicken breast sits atop a bed of baby greens tossed with a delicious salad dressing. I couldn’t stop eating this even though I was already stuffed. 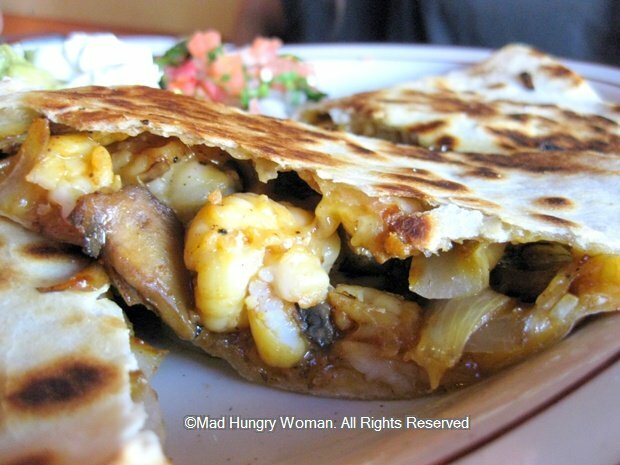 Shrimp quesadilla has got to be one of the best items here. 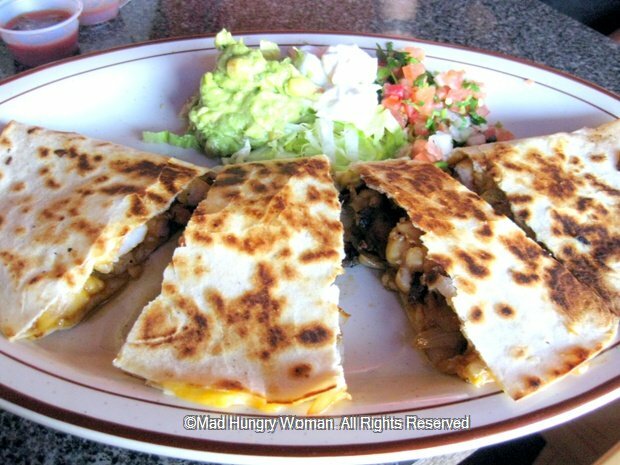 In fact, my son loves the al pastor quesadilla, but I love the shrimp. 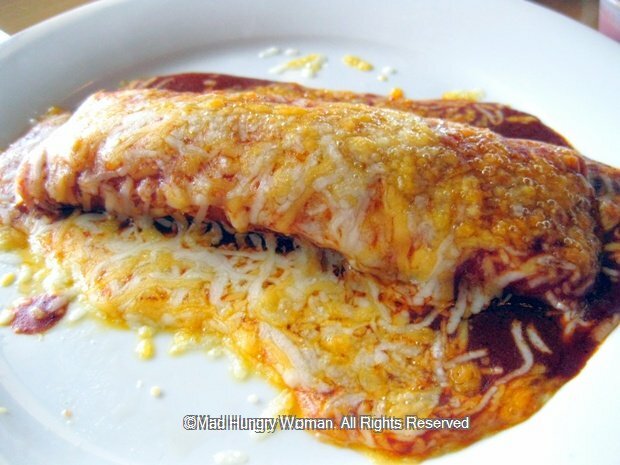 Big chunks of shrimp are stuffed into this huge flour tortilla with melted cheese oozing with each bite. You can’t go wrong with this, or any of the items on the menu. There are three locations you can go try some of this delicious fare at, so there is no excuse to not check this little gem out! Tell me which location you would most likely visit and why and you might win a $10 gift certificate to Great Mex. 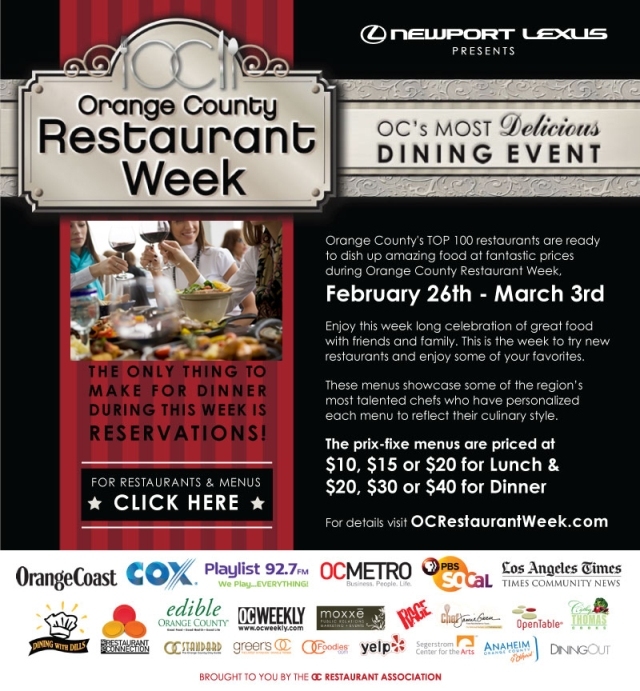 The Orange County Restaurant Association’s annual culinary event, Orange County Restaurant Week, begins this Sunday, February 26th and runs through Saturday, March 3rd, with 100 participating restaurants from across the county, ranging from upscale and fine dining, to casual and family friendly establishments. The eateries will offer special multi-course menus within three price categories for each meal period: lunch for $10, $15 or $20, and dinner for $20, $30 or $40. For a list of participating restaurants, visit the Restaurant Week website by clicking here where you will be able to find the menus listed. I will be visiting a selected few restaurants during this week so keep your eyes posted right here for those posts! An old friend was in town on business and had been stuck at her hotel for an entire week. When I got there over the weekend, she told me she had been watching this channel on TV with tons of restaurant recommendations and she wanted to eat at one of them. 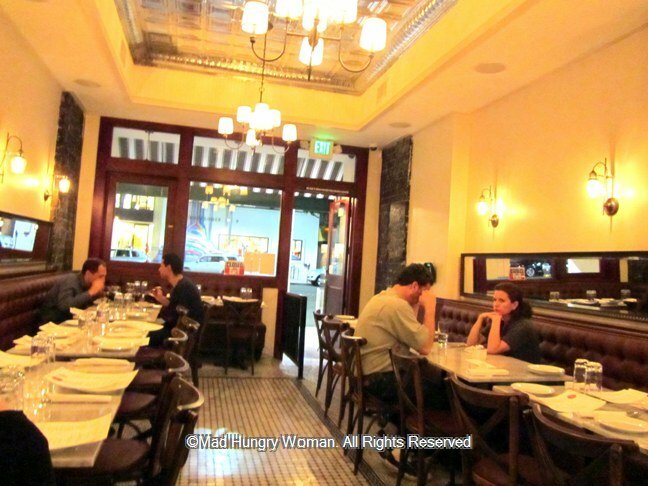 After eliminating the pretentious and those “seen and be seen” restaurants, we ended up at Pici Enoteca in Beverly Hills, a small bistro-style restaurant reminiscent of New York City rather than California. Therefore, it wasn’t surprising when we found out co-owner and Chef Jason Harley was a Brooklyn transplant and graduate of the CIA in New York. 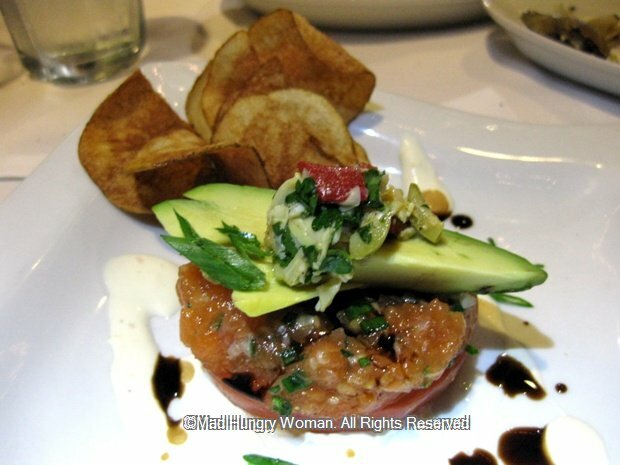 What stood out upon entering the restaurant was the owner personally greeting his customers, and he went out of his way to set us up at a table even though we didn’t have reservations and he was fully booked that evening. 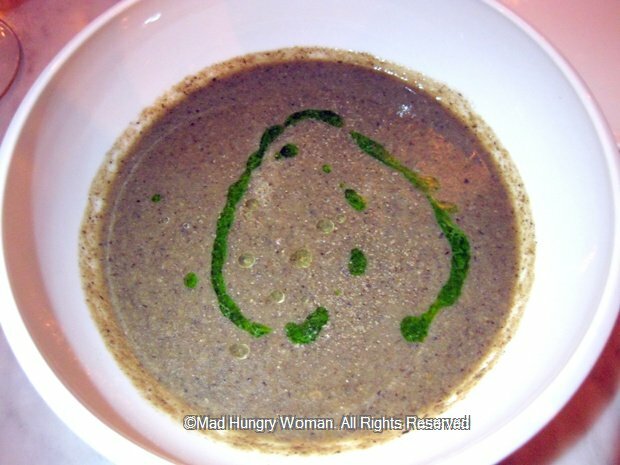 We started with Mushroom Soup ($7) a special of the day. It was full of heady mushroom aromas and texturally pleasing. A drizzle of pesto oil added an aesthetic finish but was not necessary to help the flavors any. 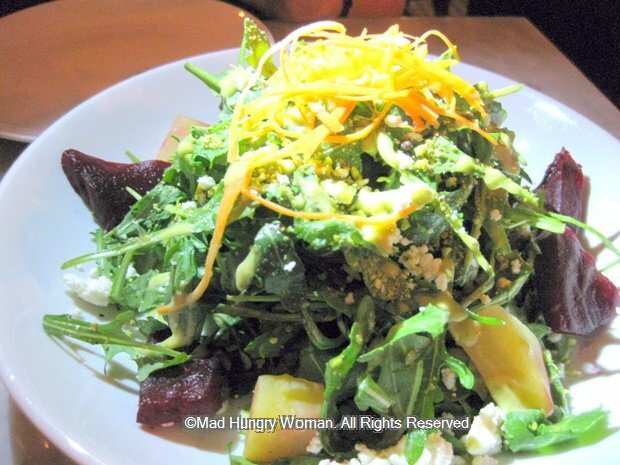 Arugula Salad ($9) was filled with beets, both red and golden. A refreshing plate of greens which we shared. In fact, I am almost always insistent on sharing everything just so I can taste as many things as possible. My friend saw the pizzas on TV so we had to order one. 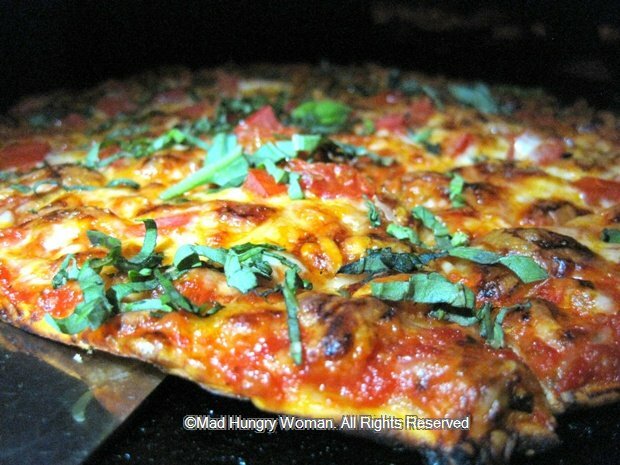 Margherita Pizza ($12) arrived on a very thin crust with tomatoes and basil. It was my type of pizza, although it wasn’t exactly Napoli-style pizza, but it still tasted great. What I came here for was the house specialty pasta — pici — something that is hand-made daily by Chef Jason. This was what enticed me from the TV. Pici is a hand-rolled thick pasta like spaghetti but cut into strips. Here, they are short, rolled up bits of pasta with the most perfect al dente texture to them. 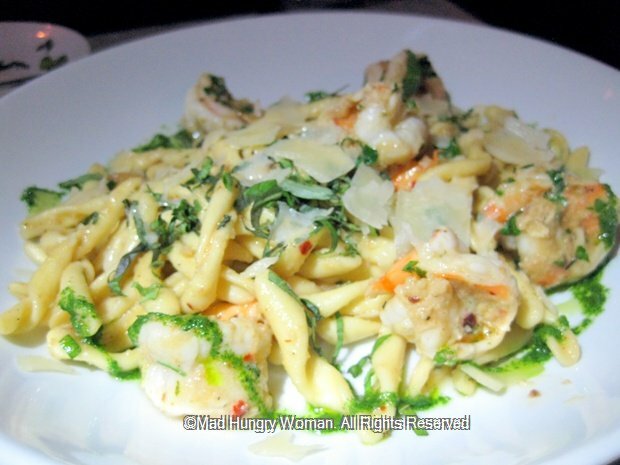 We ordered the Shrimp Scampi Pici ($20) — plump scampi with shaved Parmagiana-Reggiano and a drizzling of pesto. This is what I would come back for again. 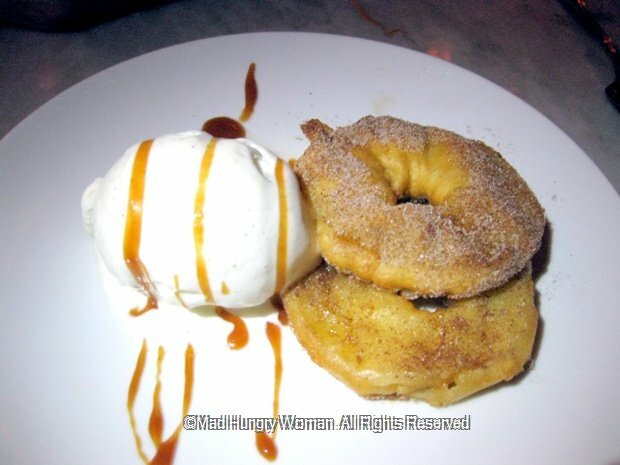 For dessert, Chef Jason suggested his special Apple Donuts with Vanilla ice cream ($7). Rounds of apple are battered and fried like fritters — although they were in the shape of a doughnut — and sprinkled with cinnamon sugar. Simple and tasty, they made a nice finish to a satisfying meal. If you plan on visiting Pici Enoteca, make sure you have a reservation. That way, you know for sure you’ll get a table and get to eat your dinner! I always forget LUCCA Cafe is just down the road from me, but the launch of its happy hour menu is now embedded on my brain, especially when I’m craving some delicious small bites along with a glass or two of the great wines they have on offer. The menu is extensive and the small plates mean you get to try as many of them as your hearts desire without filling up too much. I’ve tried every item off this menu but am bringing you the ones which clearly were winners — about 85% of the menu, mind you! 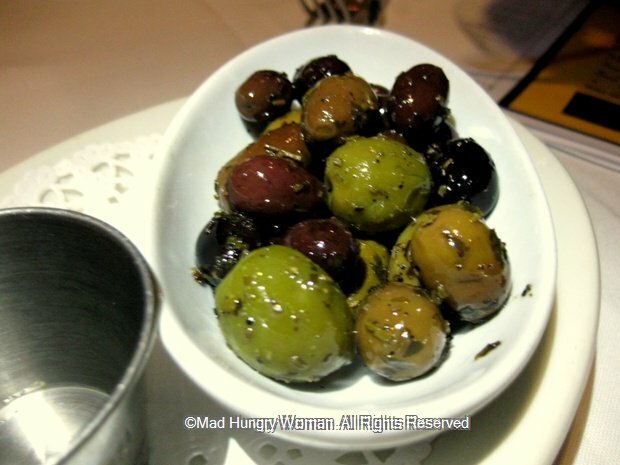 Start with Mediterranean Olive Mix ($3) while you peruse the menu. Once you have some wine in front of you, Wild Salmon Crudo ($8) with avocado, horseradish creme fraiche served with house made potato chips is delicious. I loved this dish a lot, especially the chips! 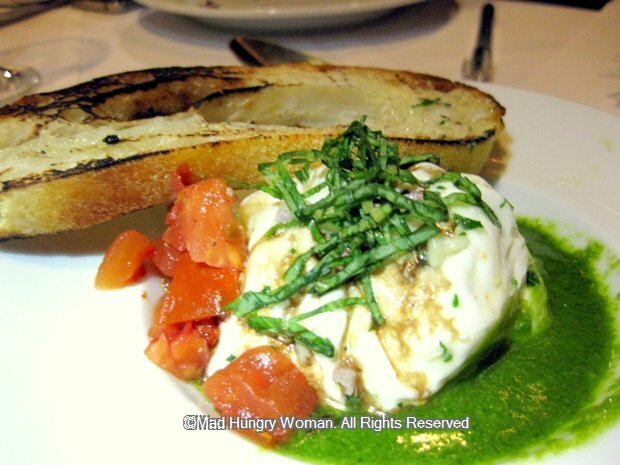 I’m a huge fan of burrata so Burrata Cheese ($8) drizzled with basil pesto, balsamic vinegar and olive oil and served with oven roasted tomatoes and bruschette on the side definitely appealed to me. One of the surprising items of the night was Bresaola Hand Rolls ($7.50). Beautifully salty bresaola is filled with poached pears, baby arugula and parmesan, blsamic reduction and lemon creme fraiche, rolled up like a sushi hand roll. The savoriness of the meat with the sweetness of the pears creates a wonderful mouthful which goes perfectly with any of the wines you may choose. The dish which surprised me the most was Braised Crispy Pork Belly ($7). I’ve been SO over pork belly, but the one here blew me away. The lean portion of the pork was so tender while the fatty part was soft but not blubbery, melding together perfectly in texture. The accompanying corn kernel-mascarpone polenta was just outstanding! More please! 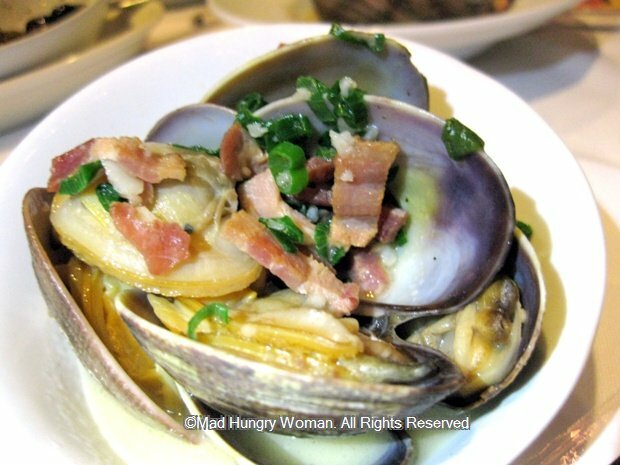 Pan Fried Sherry Clams ($6) was another winner. Sauteed with pancetta, garlic, scallions and parsley, the clams were plump and flavorful and I wanted some soft bread to soak up every drop of the delicious broth they were sitting in. If you’re a fan of butternut squash like I am, you will absolutely LOVE Roasted Butternut Squash Bites ($3). 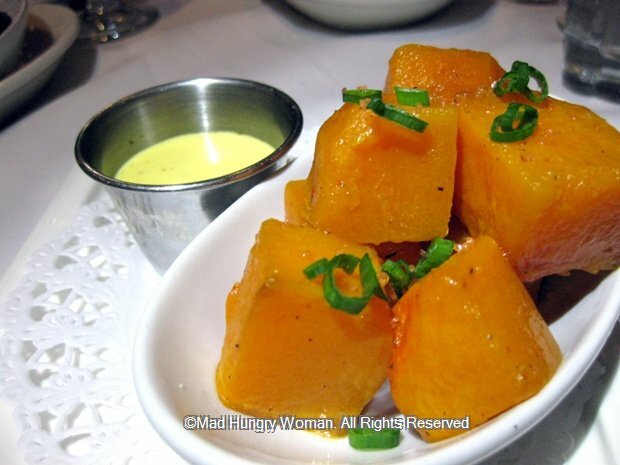 Perfect squares of sweet butternut squash are served with a gorgeous bacon-nutmeg aioli dipping sauce. Honestly, this sauce can be eaten with absolutely anything and it would be great! 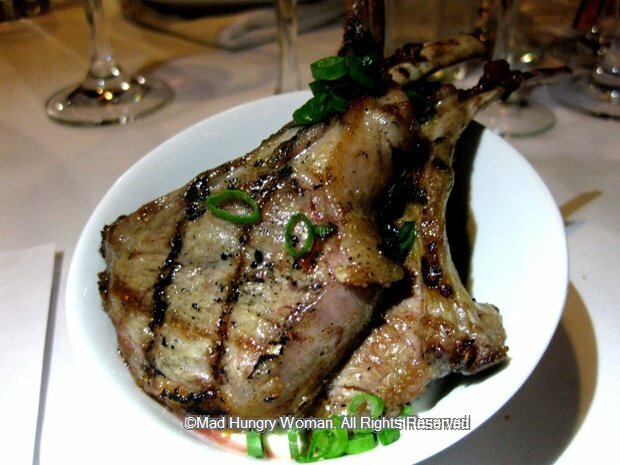 Cumin and cinnamon scented New Zealand Free Range Baby Lamb Chops ($4.50 each) are large meaty chops served medium rare with a mint/parsley yoghurt. I could’ve eaten about six of these on my own. They were THAT good! Happy Hour Bar Snack menu is available between 4pm and 6pm every single day of the week! Make sure you stop by and check it out. 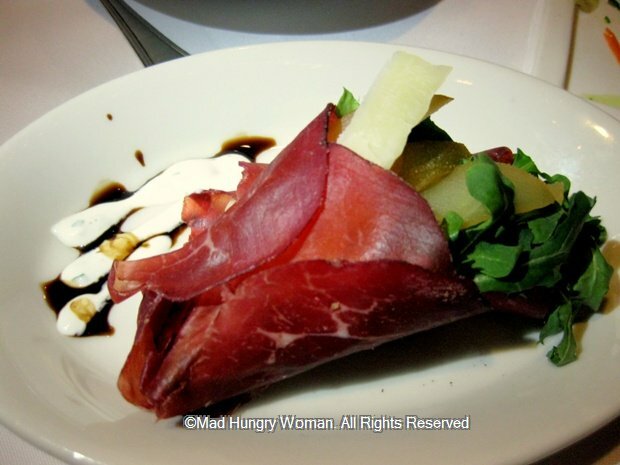 LUCCA Cafe has generously donated a $25 gift certificate to one of my lucky readers. Leave me a comment and tell me which one of these items you’re most excited to try. You have until Sunday, Feb 19. Winner announced Monday Feb 20th. 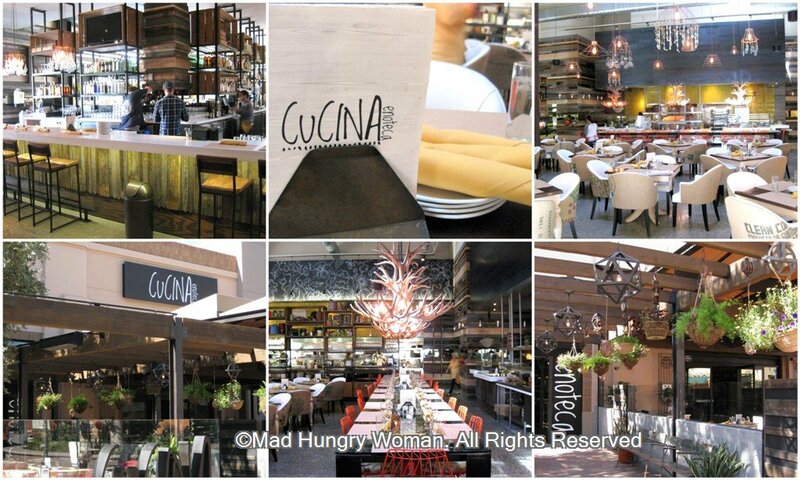 The Irvine Spectrum has seen an influx of new restaurants and one of the latest additions has been Cucina Enoteca. 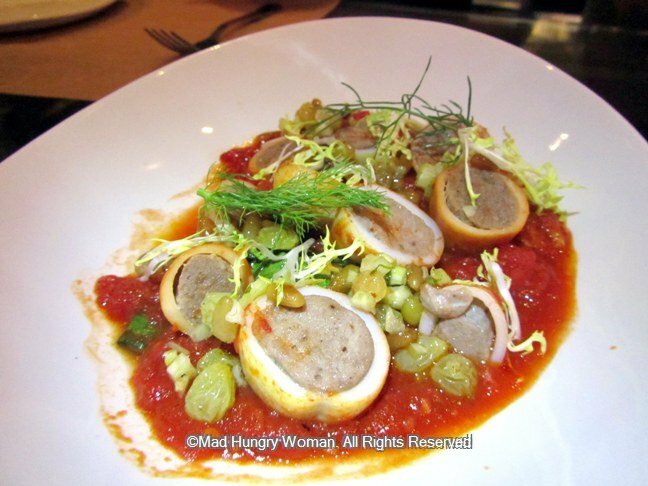 Its sister location, Cucina Urbana has a long standing reputation with local San Diego residents and now, we in Orange County get a taste of what owner Tracy Borkum has to offer. The restaurant itself is absolutely gorgeous. From the unique light fixtures to the eclectic knick knacks dotted around the dining room. I was surprised to learn that Tracy herself hand picks each and every piece and places them too. Her style is eclectic, a mix and match of everything which ultimately, comes together to create a look that is simply iconic. We tried a lot of items from the menu, both lunch and dinner and here, I will only mention the ones that stood out. 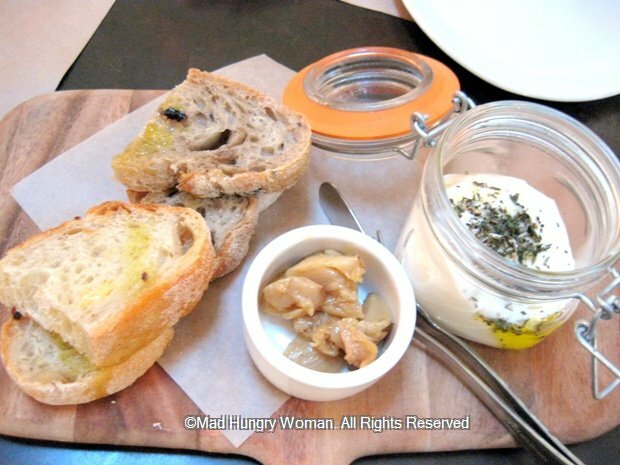 Burrata + roasted garlic confit ($8) served with some crusty artisan bread is a perfect way to start your meal. The cheese is soft and creamy and is an ideal accompaniment to the similarly textured confit. If you love a charcuterie platter, then partake in the Formaggi + salumi ($12/3 items, $15/4 items, $18/5 items). Cheese and meats vary so check with your server what’s available the day of your visit. 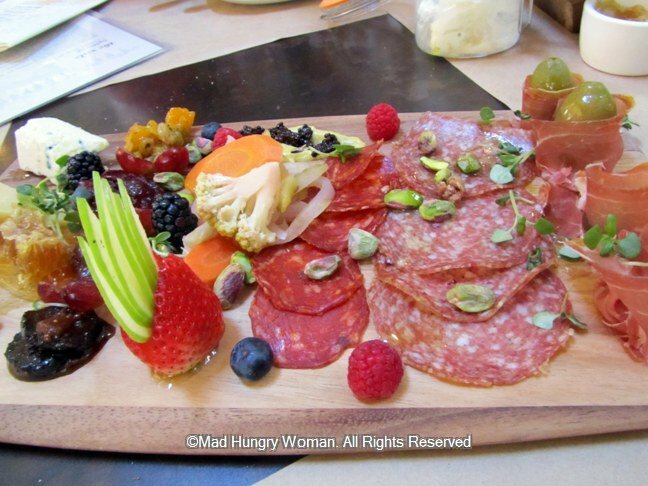 Our platter consisted of Maytag Blue, Truffle Tremor, Crotonese, Prosciutto, Salami Picante and Finocchiona. 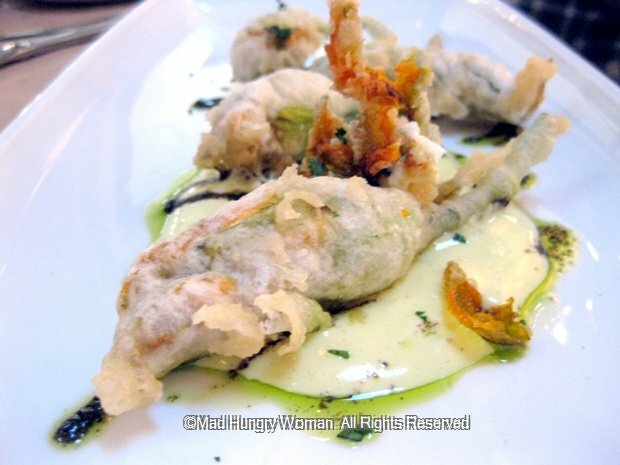 Stuffed Fried Squash Blossoms ($9.75) are filled with herb ricotta and lightly fried to perfection. These delicate fritters sit on top of purple basil pesto and cured lemon aioli and must be eaten right away for optimum flavor. 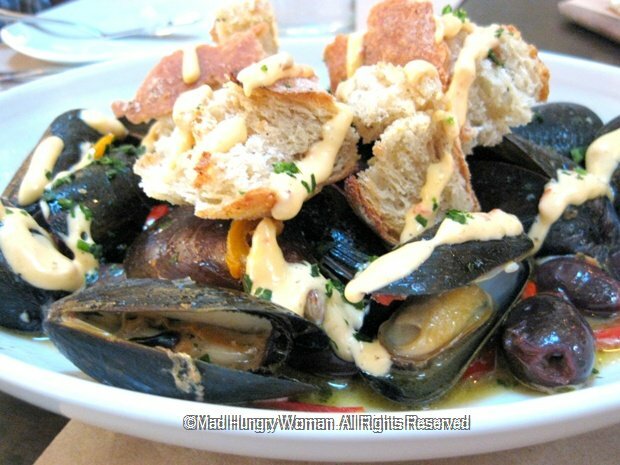 Mediterranean Mussels ($12.50) definitely was one of my favorites. The peppadew pepper, Kalamata olives, white wine butter layered the flavors well, but I didn’t feel the chile aioli was necessary. Torn garlic sourdough toast was the right choice for dipping into the wonderful sauce on the bottom of the bowl. 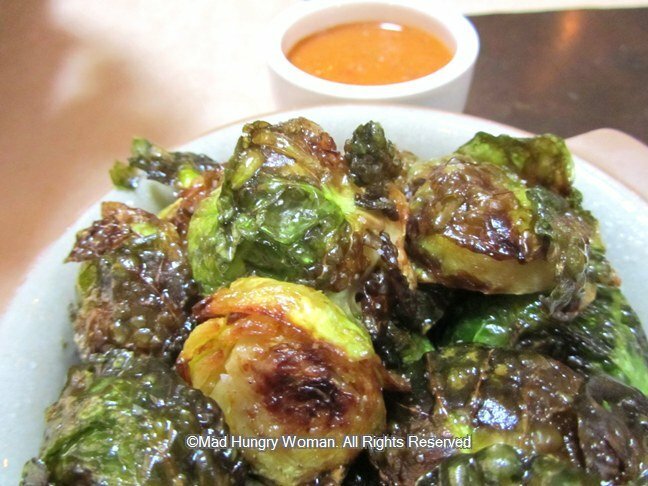 Burnt Brussels Sprouts ($6.50) with Ivan’s hot sauce is not to be missed. The Brussels sprouts are crisped on the outside and soft on the inside served with a spicy sauce which adds to the intensity of the flavors. 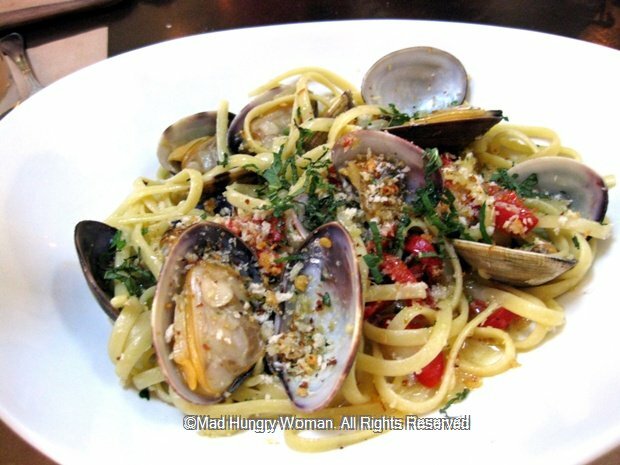 A pasta of the day ($13.95) is available daily and we tried linguine vongole with piquillo peppers. The pasta was well cooked, still al dente, and the clams were plump and meaty. The piquillo peppers lend a slight kick to the entire dish without overpowering. 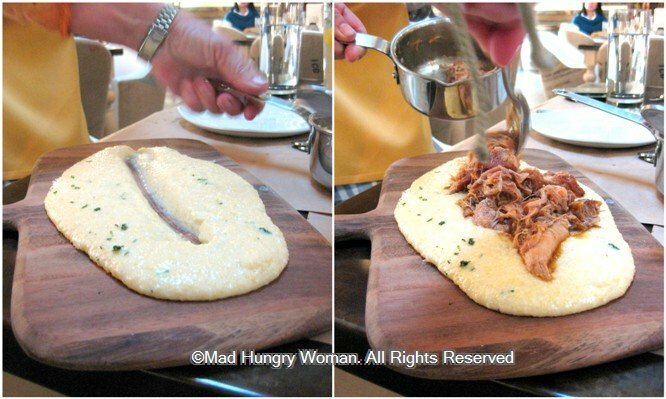 I highly recommend the Polenta board ($14), a dish which changes daily. The creamy mascarpone polenta is always the same, but each day, a ragu is made — rabbit for us — to top this delectable polenta with. Braised rabbit with caramelized onions and carrot is served over polenta and assembled tableside. I enjoyed the Cotechino Sausage Stuffed Squid ($13) with braised escarole, pine nuts, golden raisin caponata in a spicy tomato brodo even though it was a tad under-seasoned. 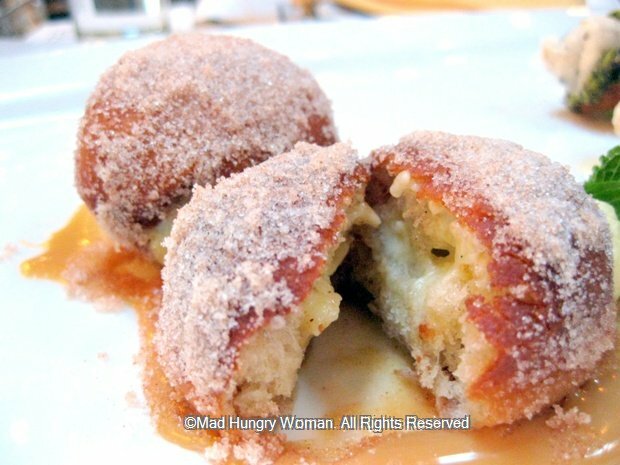 At the end of the meal, finish off with Zeppole ($7), Italian-style doughnut-holes filled with vanilla creme and coated with cinnamon sugar on top of dulce de leche. Or alternatively, Bittersweet Chocolate Budino ($8.50) with chocolate chantilly and topped with salted chocolate cookie is another sweet treat I recommend. The dark chocolate is not overly sweet and very addictive, even to this non-sweet-toothed glutton. 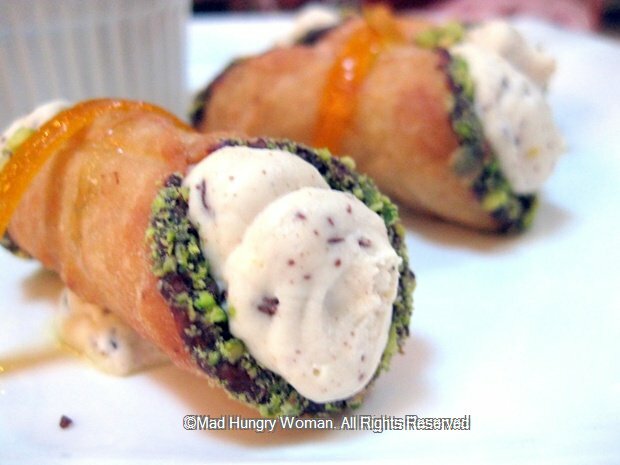 The Sicilian Cannoli ($8) filled with orange chocolate ricotta crema and dipped with chocolate and pistachios are delectable! Get an order to share, you won’t regret it. The restaurant is great both for lunch and dinner, but I love it during the day when you are able to see every little detail that’s been put into the decor. The restaurant also has a special wine program where you can buy any bottle of wine they have available at cost price and you can have it with your meal for $8 corkage.